Reduce size without loss in quality. If you’re using a professional NLE, then I recommend you compress your video from it. My favorite encoder bar none is Adobe Media Encoder or Adobe After Effects. 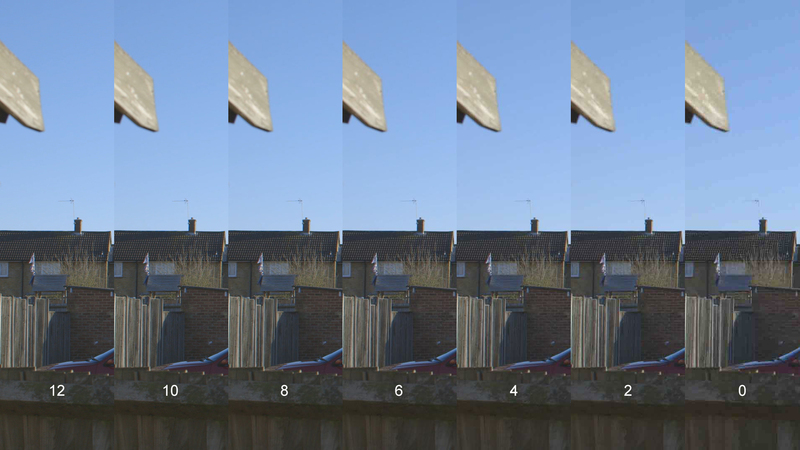 As you can see, quality 8 shows visible artifacts, while quality 12 is visually indistinguishable. In video-speak, let’s assume the frame rate is 24 fps. If the size of each frame is 575 KB, then the data rate is about 100 Mbps. This is why broadcast guidelines often call for 100 Mbps as the data rate if you’re using an intra-frame codec. Nowadays, most cameras record in inter-frame mode. The results are similar to our ‘perfect’ image above. From quality level 8 on down you can see clear artifacting. What happens when we use inter-frame compression? 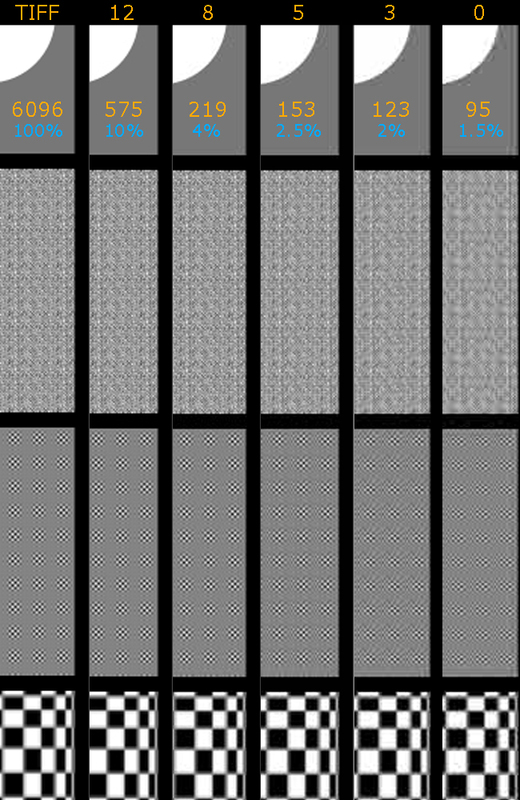 We actually get more leeway, since we have frames adjacent to the current frame to use for compression as well. The C300 typically shoots 50 Mbps Long GOP, which is the minimum recommended data rate by broadcasters for inter-frame codecs. Do you see what I see? 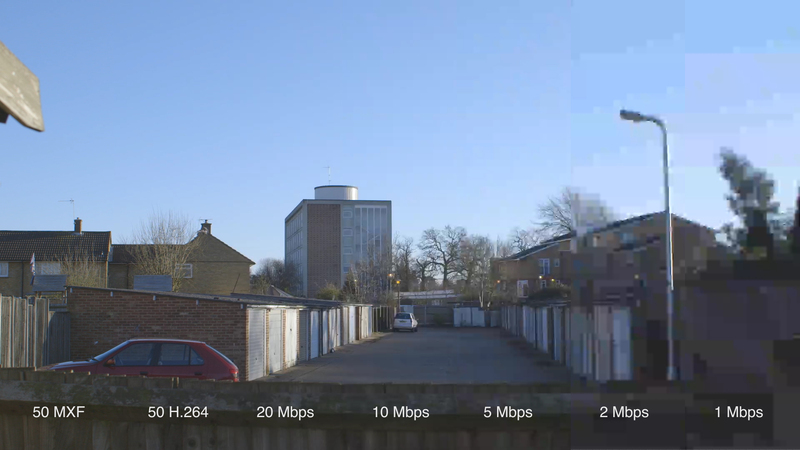 At 5 Mbps, the details in the image turn into mush (look at the tree, bricks and sky). 10 Mbps seems to be the limit, even though it doesn’t look very pretty. 20 Mbps is more like it. Well, if 100 Mbps is good for intra-frame codecs, and level 8 (corresponding to 50 Mbps) is acceptable for web viewing, then similarly, 20 Mbps is acceptable web viewing for a 50 Mbps video. In any case, most Internet video platforms are based on H.264, which is an inter-frame codec. What this means is, no matter what you’re shooting with, you might want to have a resulting video that is at least 20 Mbps in size for it to be reasonably good web video quality. And that might not be enough, either. Uploading videos to the Internet isn’t rocket science. I hope this simple article has explained how to compress a video for Internet consumption. What do you think? What results have you achieved in your own uploads? Hello Sareesh….thanks for your many great articles. I am having some trouble understanding the optimum settings for ‘Key Frame Distance” in Premiere Pro. I have seen some say I should choose the equivalent of my frame rate (e.g. ‘Key Frame Distance: 24’ for a 24fps video export). Please help me to understand this setting. When you’re talking about that are you referring to the export settings when you choose interframe codecs? If yes, then for example once you select the appropriate codec leave the distance as is, as the long GOP defaults have been tuned for best results. A few years ago I did test this but I never found any improvements. Try rendering a clip at default settings and then change, render, rinse and repeat. I leave it at their default values. Hello, when you say a Keyframe every third frame it means a keyframe distance = 3? I’m trying to export a 360 video to youtube, we are having the problem to buffering the video in our 360 app. Our video has 24fps. Could you help with this issue? (I followed the other settings like youtube has suggested). Compressing a video is essential when you want to upload a video which is too large in size. In doing this, we have to be familiar with terminologies often related to compressing a video file like codec, key frame, artifacts, Bit/data rate, variable bit rates, frame rates and resolution. Compressing a video file is easy to do by following these basic steps: Understand why you need to Upload a video, Open your raw video file in a video editing program, Export the video, Select the file format, Select the video format (codec), Select the bit rate, Select the resolution, Adjust the key frame and frame rate, select the encoding mode, Select your audio options. In line with this, monitoring your videos in Vimeo and Youtube will be a hassle-free with the use of BeUpon online tool. This system will help you track the status of your videos 24/7. It alerts you whenever your videos were down. It also helps to set-up back up videos. For more information, visit this site: http://www.beupon.com/. It even can resize audio file size. It has both Windows version and Mac version. Thanks for this, I was testing myself. But usual, you read my mind! Brutal upload times are worth it, to avoid the hideous compression artefacts on skin, most noticeably. I wish YT were a bit more honest about their special sauce!